An unstoppable march? Maybe. The consistent monthly practice of smashing unemployment records in the eurozone continued in April with the overall total reaching 12.2% while youth unemployment hit a whopping 24.4%. 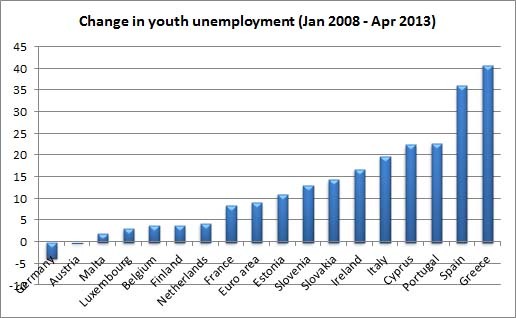 As the graph highlights (click to enlarge) youth unemployment has risen a staggering amount in some countries since the start of the crisis (for countries where April data is not yet available the latest month available was used). The problems in Greece are well documented but some very large economies also have some very serious problems with youth unemployment. In April it stood at 56.4% in Spain, 42.5% in Portugal and 40.5% Italy. The longer this goes on the more problems it will cause both economically and socially. It creates a split within society with many young people seeing a very bleak future; traditionally this has also fed populism and the rise of extreme political parties. Economically it hurts the long term productive potential of the economy as some of these young people see their productivity reduced by long stints out of work, while many others will look for work abroad potentially creating a 'brain drain' and worsening an already troubling demographic problems. William Hague will today further develop plans for a new 'red card' system for national parliaments to block unwelcome laws from Brussels, a move first proposed by Europe Minister David Lidington a couple of weeks ago. In a speech in Germany, Hague will argue that only by giving greater powers to national MPs, rather than MEPs in the European Parliament, will Europe be able to restore the democratic deficit. The proposed 'red card' would beef up the little-known 'yellow card' system already in place, which is pretty weak in practice since it only forces the Commission to ‘reconsider’ a proposal. "However, whilst it's encouraging that the UK government is looking at this, it must press ahead with this reform now to avoid the impression that it has no immediate strategy in Europe - a charge that's becoming more frequent. There's support for this reform in other parts of the EU." This is the first major proposal for EU reform the Government has made since Cameron's speech and it is a very welcome one. The fact Hague will make his speech in Germany is no accident and there is certainly a great deal of support for this idea amongst other member states who feel that for too long the EU institutions have run roughshod over national politics - yesterday's intervention from the Commission on migrant benefits (another area where the UK's concerns are shared with other powerful EU countries) is a case in point. Its also worth noting that this option would enjoy substantial support among the UK public with 42% of respondents in the recent ComRes poll for Open Europe listing "giving the UK parliament more powers to block unwanted EU laws" as one of their top four priorities for renegotiation. Of all the available options, this was the second most popular after immigration. We need to see much more of the same and, all importantly, the political will to make it a reality. Update 31/05/13 09:40: As we noted below, it seems that the figures do include some of the write-downs of deposits under the bank restructuring (but not all). Apologies for the confusion. As the Central Bank of Cyprus notes the initial write down for Bank of Cyprus depositors is included. This totals around €3.2bn. This means the actual outflow was around €3bn, similar to the previous month. This is still fairly significant, although we expect much of this may be domestic and due to people and businesses running down their cash reserves. This also likely reduces some of the concerns over the workings of the capital controls. The data does give some feeling for who might be losing from the bank restructuring - US Dollar depositors and foreign NFCs are probably a large share. The concerns over the bank deleveraging and increasing reliance on central bank financing also remain (since they were already well established). The real test of the deposit flight will come, firstly once the bank restructuring is complete (by end of July) and secondly once the capital controls are removed (who knows when). 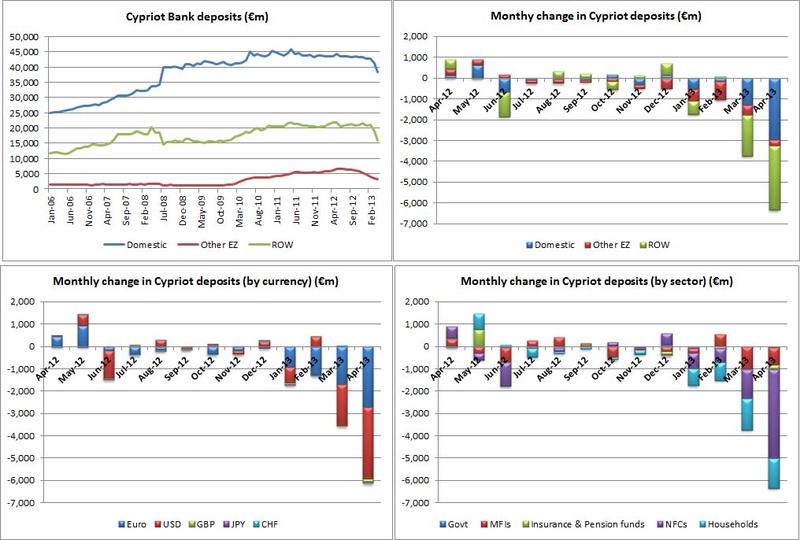 Yesterday saw the release of the latest data on the state of bank deposits in Cyprus – which always makes for interesting reading. The headline figures are pretty terrible. 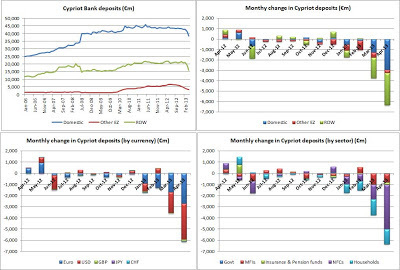 Overall deposits declined by €6.346bn (10%) in April, almost double the level seen in March (when the crisis was in full swing) - despite stringent capital controls being in place for the entire month. 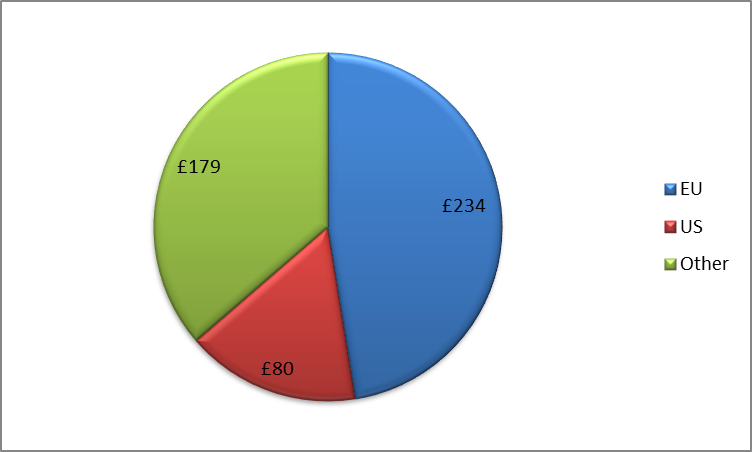 However, given their importance, these figures deserve delving beyond the headlines. First, it’s clear that the deposit flight is continuing despite the strict capital controls. This is concerning, since it shows the Cypriot government’s inability to enforce the rules, particularly on the financial sector. It also means that capital controls continue to hamper the functioning of the Cypriot economy, but are failing to stop an outflow of money (though admittedly it could have been much larger without them). Second, the outflows are split between domestic residents and those in the rest of the world (ROW). ROW deposits are unlikely to return for some time. Cyprus could hold out hope that domestic residents are just stashing cash due to concerns over the economy and banks, meaning this money may eventually return. Unfortunately, given the bleak outlook this is unlikely to happen anytime soon. Third, a surprisingly large amount of the withdrawal (€3.2bn) has come from deposits held in US dollars. This money might also have moved abroad and is unlikely to return, suggesting both domestic and foreign investors are moving money away from Cyprus. Lastly, much of the withdrawal has been by non-financial corporations (NFCs) and households. This was perhaps more predictable, but again raises concerns about the future of investment and consumption in the economy. The underlying data shows especially strong withdrawals from ROW households and NFCs which have been a big source of economic growth for Cyprus in recent years. It could also peak concerns over the impact the capital controls are having, as firms and households are forced to eat into their cash reserves (although they still remain at a decent headline level). One important point to keep in mind concerns the losses for some uninsured depositors under the bank restructurings. It is not clear from the Central Bank of Cyprus figures whether this has already been accounted for in the data above, although this looks unlikely since the process is still continuing. That said, if it has been, then the actual withdrawals are smaller - though still high. The overall economic impact also remains similar. What does all this mean for Cyprus and the eurozone? Much of it confirms what many people feared in the aftermath of the crisis. In particular, it paints a bleak picture for future growth in Cyprus as money flows out of the economy. It also raises questions over whether such outflows were accounted for in the overly optimistic assumptions about Cypriot growth. Another problem will be bank financing. Cypriot banks are locked out of the markets and may well be for some time. With deposits falling they will be forced to access more ECB liquidity and possibly the Emergency Liquidity Assistance (ELA). This is something which the ECB has notoriously been trying to avoid in Cyprus, and more generally. Not least because under any future restructuring/default/euro exit scenario the ECB would face larger losses. But it’s also important to remember that there is a limit to how much Cypriot banks can access through these facilities since they require assets to be posted as collateral. Even if they are able to, it is clearly possible that this pressure could force them to increase the already rapid pace of deleveraging. This would undoubtedly further hamper lending to the real economy and in turn economic growth. As noted above, from a wider perspective it will increase already pressing concerns over the enforcement of the controls and more generally over regulation of the financial sector in Cyprus. So, some are asking, isn’t this simply a case of the Commission enforcing the law? To answer this question, you have to get to the real heart of the matter, which neither the Commission nor the UK Government has really set out explicitly. It is a rather complex technical issue of how certain benefits are defined and how the UK’s welfare system interacts with different EU laws. The underlying issue is that most EU countries tend to have a generous ‘social security’ system but one which is generally financed by in-work contributions (so as a migrant you wouldn't get access without substantial contributions and neither would a host national). They tend to have a lower safety-net ‘social assistance’ scheme (if they have one at all). EU law (under the Free Movement Directive) allows governments to indirectly discriminate when assessing claims for ‘social assistance‘ and prevents people gaining residence rights by simply accessing social assistance. For social security (for which there is a separate EU Regulation) all forms of discrimination are prohibited. It is important to remember that the right to free movement within the EU is not unqualified – you have to be travelling to work or seeking to work. Travelling to access social security was not envisaged, but workers should be treated equally while in work. 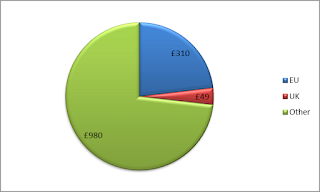 In the UK, for unemployment benefit for example, there is a flat rate Contribution-Based Jobseekers' Allowance and also Income-Based Jobseekers' Allowance. The former is nominally financed by employee and employer contributions through National Insurance (but in effect are funded through general taxation) as pay-outs are not linked to contributions and the latter is means tested. From the Commission’s challenge it appears that it thinks both types of JSA should be considered ‘social security’ and therefore there can be no indirect discrimination, which they argue the ‘right to reside test’ is. However, unlike in other countries, that means incoming migrants can potentially get access to the bulk of UK welfare system having contributed very little, if anything at all. This is why the Government is defending the ‘right to reside’ test as a means of ensuring you can only claim in the UK if you have a legal right to be in the UK and an economic link to the country. The Government would also argue that Income-Based Jobseekers' Allowance should be defined as ‘social assistance’. 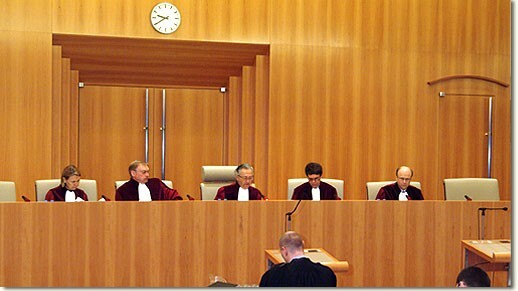 However, yesterday, the ECJ’s Advocate-General came down in favour of the Austrians, whose argument was supported by the German, Irish, Netherlands, Austrian, Swedish and UK Governments, in saying that the particular benefit constitutes social assistance and that Austria can therefore impose safeguards. IDS has taken heart from this opinion and the Government believes the same principle applies in the UK case. In Spain, there is now a different but related argument about the refusal of some hospitals to recognise the European Health Insurance Card – it is as yet not clear why the hospitals have refused but Spain is also subject to legal challenge from the Commission. In short, the EU’s current rules in this area, which have largely developed through case law, are hugely complex and do not reflect the different national systems that are in place. As IDS said, the UK Government is already talking with “the Germans, with the Dutch, the Danes, the Spanish” about setting the limits to the EU’s power in this area. Given that, this is completely the wrong time for the Commission to launch an intervention as politically explosive as this. It is also worth adding that there is a cross-party consensus on this issue with Shadow Home Secretary Yvette Cooper today backing the coalition's position. The UK should therefore avoid merely a narrow defence of its right to reside test but use this opportunity to settle this issue once and for all with root and branch reform. Building on our blog from yesterday, Open Europe’s Raoul Ruparel has an article in City AM today discussing the Commission’s country specific recommendations. Raoul argues that, despite protestations to the contrary, this is far from a wholesale change in policy but only a small change in the pace of policy implementation. Raoul also brings in an earlier discussion from this blog regarding the nature of the austerity vs. growth debate in Europe – fundamentally the real choice remains between creating a new eurozone architecture or breaking up. A REVOLT against austerity. A shift to growth. A new policy for the Eurozone. The supposed new approach, symbolised by yesterday’s European Commission economic recommendations for each Eurozone country, has been called many things. But once the rhetoric is stripped away, any changes that remain are largely semantic. The Eurozone remains on the same policy path; at most, it is just progressing along it at a more leisurely pace. Let me quickly recap yesterday’s recommendations. Spain, France and the Netherlands were all given more time to meet their deficit targets, albeit in exchange for more open-ended commitments to deep structural reform. Don’t forget that this is far from a new precedent; Greece, Portugal and Spain have all received numerous extensions over the past few years. Meanwhile, Italy exited the proverbial EU economic dog house known as the “Excessive Deficit Procedure”, a move which in normal times would allow it more economic freedom. Unfortunately, these remain far from normal times, and few doubt that those in charge of the purse strings in stronger Eurozone economies will continue to scrutinise every Italian policy move as if it were their own. Countries like Belgium and Slovenia got some leeway, but were also on the receiving end of a textbook scalding for a lack of structural and financial market reform – the type of which most Commission officials could probably dole out from memory by now. For all the fanfare over the past months and weeks, this “new path” seems very much par for the course. 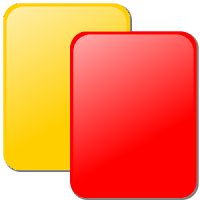 Yes, there is a tweak here and there, but much in the same way a football manager might bring on a defender when his team is getting thrashed – it’s more about saving face than making a sizeable impact on the course of the game. The first question to ask is, despite this not being the wholesale change it was cracked up to be, will it have any impact on the crisis? In a word: unlikely. It’s clear that the current policy approach is not working, and in many cases a slowdown in the pace of cuts will be helpful – at least in political and social terms – as it allows a slower pace of wage and jobs cuts. That said, the amount of additional fiscal spending to be allocated to boosting the real economy remains a pittance in comparison to collapsing domestic demand and falling investment in many of the struggling countries. Further, it’s worth noting that, although some spending cuts have been slowed, the flip side of this will be deeper and faster structural reform. In many cases this falls heavily on the labour market. Unfortunately the short-term impact of such reforms, no matter how necessary, is often increased unemployment. The second and more interesting question is, what more could actually be done on this front? This brings us, inevitably, to the broader question of austerity versus growth. This has become a key debate during the crisis, but it fails to capture the key question in the Eurozone. It is clear to everyone that Greece, Portugal and Ireland were insolvent, and it was market pressure that pushed them into bailouts. Reducing debt levels is a vital part of their reform, while also serving to counter the significant moral hazard that comes with a bailout. Similar constraints apply in Spain, Italy, Cyprus and Slovenia in terms of expanding spending in the short run. Therefore, asking to end austerity in much of the Eurozone is akin to asking for greater transfers from the stronger countries – whether direct, through fiscal union, or indirect, through banking union or much higher inflation. This provides us with a clearer picture of the situation. First, the widely mooted change in Eurozone economic policy actually amounts to little more than a small adjustment, slathered in a thick coating of political rhetoric. Secondly, in reality there was little room for adjustment to this policy. This is mostly because many states have little room for further spending, but also because the decisions lie with national governments and parliaments, not the Commission. This brings us to the conclusion that, rather than discussing whether or not to change austerity, there should be more focus on solutions that can really solve the crisis. The fundamental choice for the Eurozone remains the same as it always has been: the creation of the necessary architecture to deal with a widespread economic crisis, or face a break-up. Our Research Director Stephen Booth was on BBC Radio 4's Today Pragramme this morning discussing the news that the European Commission is today expected to take the UK Government to court over the so-called 'right to reside' test that is applied to EU migrants seeking to claim certain welfare benefits. We don't have all the details of the legal challenge yet, they are expected to be released later today. "What is also important to understand here is the UK has a particular welfare system that is universalist and involves lots of means tested benefits, unlike on the continent where a lot of it is based on contributions. So we have a system that needs safeguards in order to ensure that only people who are eligible can claim benefits and that's what the right to reside is meant to ensure." The European Commission has thrown a political hand-grenade into two deeply controversial domestic debates: Europe and immigration. It is the worst possible issue to challenge the UK on, and at the worst possible time. As we have argued in the past, we think free movement has its upsides, but you cannot have free movement without public confidence that the freedom won't be abused. On this showing, it is difficult not to draw the conclusion that some senior figures in the Commission would be quite happy to see the UK leave the EU. The [European] Commission doesn't have to dictate to France what it has to do. It simply has to say that France must restore its public accounts. It may seem that, through statements like these, Hollande contradicts his own call for a "real economic government" for the eurozone. But remember, when France talks about le gouvernement économique, what it has in mind is an intergovernmental structure where member states have the last word - not a supranational one where the European Commission has the power to veto national budgets. Incidentally, the latter is what Germany wants. 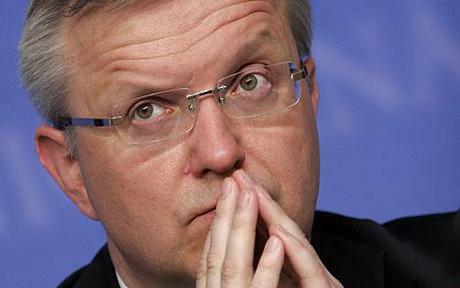 In turn, the remarks clearly show how difficult it will be to achieve a eurozone fiscal union. Will France ever accept being bossed around on economic issues - and the type of strict supervisory powers Germany demands for underwriting the eurozone? As we've said before, this is a pretty brutal Catch-22 situation. We keep our eyes open for further reactions. According to the European Commission, Spain should “improve the efficiency and quality of public expenditure at all levels of government”. Clearly, this is easier said than done, given the well-known problems the Spanish government is having in trying to rein in regional spending. The European Commission also seems to suggest that the 2012 labour market reform – one of the flagship measures adopted by Mariano Rajoy’s government – may need tweaks. In particular, Spain should reform its active labour market policies. Spain should also push ahead with the liberalisation of closed professions and improve the business environment in general – for instance by cutting the amount of paperwork, a notorious issue in the country. Spain should “further limit the application of VAT rates”. This might be controversial, as the Spanish government has said several times it is opposed to further VAT hikes. According to the Commission, the reform of Spain’s pension system should be finalised by the end of the year. The recommendations for France include quite a few suggestions which may be hard to digest for François Hollande’s socialist government. France should do more to cut labour costs, in particular by reducing social security contributions for employers. The European Commission says France should adopt new measures by the end of the year to “bring its pension system into balance in a sustainable manner no later than 2020.” The Commission suggests various ways of doing this, including “adapting indexation rules” (remove/reform the link between inflation and pensions increases, in plain English) and raise the retirement age. This is unlikely to go down well in Paris. France’s unemployment benefit system should be “urgently” reformed, so that it is sustainable but also “provides adequate incentives to return to work”. Make sure that the reforms initiated by Monti's government are properly implemented (some of them require enacting legislation). Push ahead with labour market reform. Wages should be better aligned to productivity, and more should be done to bring young people and women into work. The tax burden should move from labour and capital to consumption, property and the environment. Sure enough, this is going to be controversial, given that the new Italian government is trying to avoid a VAT increase scheduled by its predecessor for 1 July 2013 and is also considering scrapping a property tax on first homes. Continue with liberalisation of the services market and opening up of closed professions – which seems to be an issue affecting all the Mediterranean eurozone countries. Needless to say, all this has to happen without breaching the EU’s deficit limit of 3% of GDP and in parallel to a reduction of Italy’s gigantic public debt (forecast to be over 132% of GDP in 2014). As we have previously warned, the Commission flags up the risk of the heavily indebted corporate sector and how this in closely intertwined with the fate of shaky banks. Of the largest domestic banks the Commission warns, “Their dependence on the state for capital is a substantial threat to the economy” and that “Further recapitalisations are foreseen in the stability programme”. The Commission does not give an estimate of the recap needs but it’s clear there is concern that it could impact the Slovenian economic situation. To this end it also called for an independent review of the Slovenian banking sector. Government growth forecasts are seen to be overly optimistic, particularly next year's, this could be further hampered by the banking sector. Significant push needed on cutting wages and increasing productivity, true in most places but especially on Slovenia when costs have been on a rapid rise in recent years. Need to push on with privatisations and come up with a clear policy framework to do so. More structure needed, particularly if investors are to be convinced. “Further reform efforts are required to improve the sustainability of pension expenditure in the long-term, including through aligning the statutory retirement age with gains in life expectancy and by further restricting early retirement.” – numerous concerns expressed about long term liabilities of the state. “Germany should do more to open up their services sector by removing unjustified restrictions and barriers to entry, thereby leading to lower price levels, making services more affordable for lower income groups.” – particularly calls for the opening up of public procurement, professional services and retail services. “Sustain conditions that enable wage growth to support domestic demand.” – although it sounds innocuous this could be very controversial in Germany. It essentially seems to endorse the calls for Germany to spend more and allow inflation to help rebalance the eurozone. Germans fear of inflation is well known but they also fear a decrease in the competitiveness. Remove barriers in the services sector. So, for all the talk of this being the ‘end of austerity’ or ‘austerity in retreat’, is much really changing? Sure, there is some tinkering with timelines for deficit reduction (Spain, France and others have been given more time to cut public deficit), but ultimately the eurozone is still going along the same policy path - just slightly more slowly. Cases in point are the countries above, since the clear themes running through all of them are the need for structural reform, welfare reform, fiscal consolidation and liberalising the economy. These are things which have long been advocated and are clearly necessary. The question remains whether they can all be done at the same time by a group of countries which are closely interlinked, and many of which are currently in recession. Unintended consequences: could tariffs on Chinese imports actually harm the EU's solar panel industry? The past few weeks have seen a marked increase in hostilities between China and the EU over the ongoing trade dispute, centred on the solar industry. Given that it’s between two of the largest economies in the world, this dispute is not to be sniffed at. 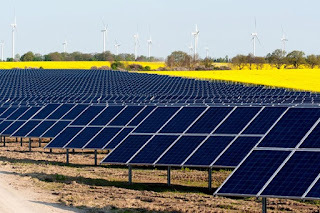 As the WSJ noted last week, the Chinese government has increased its rhetoric against the recent EU trade investigation in illegal subsidies to solar panels imported to the EU from China, while the threat of similar action on telecommunications is deepening the divide. Tensions peaked over the weekend with the Chinese delegation to the EU putting out a press release containing a veiled threat of retaliation if the EU pushes ahead with tariffs and other protectionist measures. Below we lay out some background and key points on the solar panel case which is driving the dispute. To recap, last September, DG Trade at the European Commission launched an anti-dumping investigation into whether imports of Chinese solar panels and their components were being given unfair subsidies by the Chinese government. The investigation was launched after a complaint by EU ProSun, a collective of European solar firms. This group is led by the EU’s largest solar firm Solar World. Solar World was instrumental in pushing similar action in the US (which also instituted tariffs). 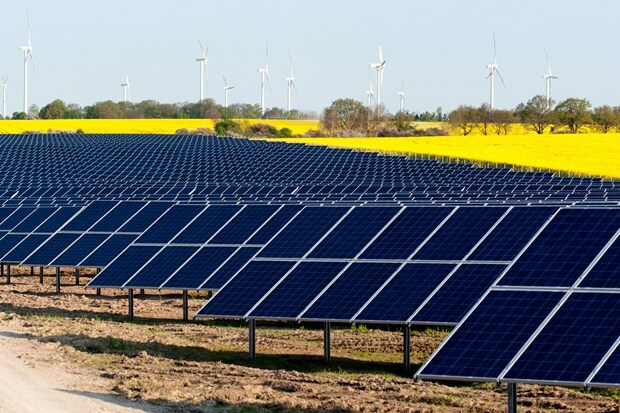 DG Trade has announced that imports of Chinese solar panels will face tariffs of between 37.3% to 67.9% from 6 June 2013, although the exact amount will vary from firm to firm (until that date the ruling can of course be altered). This ruling is temporary and the duties are provisional since the investigation (and other similar ones) are still on-going. Once the investigation is complete the findings are presented and the issue is put to the Council of Ministers for a vote on whether to impose permanent duties. There are a lot of different legal, economic and political points to consider here. It is clear that the Chinese firms are receiving significant subsidies and by the letter of the law there should probably be some tariffs. However, this episode obscures a much more fundamental point: the EU’s solar panel market is to a large extent unsustainable. In the early 2000’s Solar firms were given significant subsidies, especially in Germany, and were able to expand rapidly despite being barely commercially viable. Once the eurozone crisis hit, and governments had to start cutting spending, the subsidies dried up. Ironically, cheap imports from China are likely to have played a significant role in supporting this market as public subsidies in Europe wound down (by helping to bring down production cost). Similarly, given the variety of cheaper options available, solar cannot yet be commercially competitive without some form of government support – be this directly from Europe (which cannot afford it at the moment) or indirectly from China. So, again, ironically, there's a risk that the tariffs contribute to killing off Europe's own solar market - raising questions about the Commission's claim that the tariffs are needed to protect 25,000 European jobs. This is also a classic example of large firms using their market position to lobby the EU to take action to lock in the status quo. Larger firms such as Solar World are keen on the tariffs and/or other protectionist measures while smaller firms (that are looking to partner up with and import cheap components from Chinese firms) are reluctant. Finally, whilst the Chinese government isn't exactly whiter than snow, the EU must be very careful not to trigger a trade war - not only would it be economically damaging, but the EU's trade image would also be seriously damaged. Finding a compromise should be the short term goal, but over the longer term it poses an interesting question over how national policies impact other countries (see also the prospects for currency wars) and what can be done to manage this. This dispute should also force the EU to consider its position on heavily subsidised markets which are very rarely viable over the medium and long term. So, what next? The dispute is likely to continue, although a statement last night by EU Trade Commissioner Karel De Gucht did show some signs of conciliation. A decision on whether to impose the temporary tariffs will be needed by the 5 June - if they are imposed then the dispute could escalate quickly. These would run until December when the investigation is complete at which point the findings and prospect of permanent tariffs would be put to the Council of Ministers. 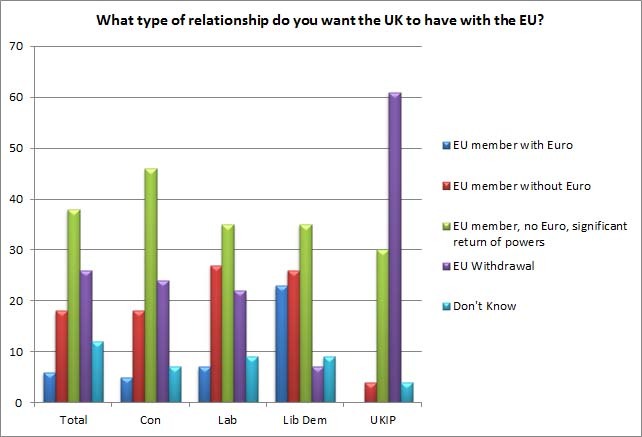 There has been a lot of debate recently about what the UK public really want in terms of the UK’s relationship with the EU. In an attempt to shed some further light on this Open Europe has today released a new poll conducted by ComRes. 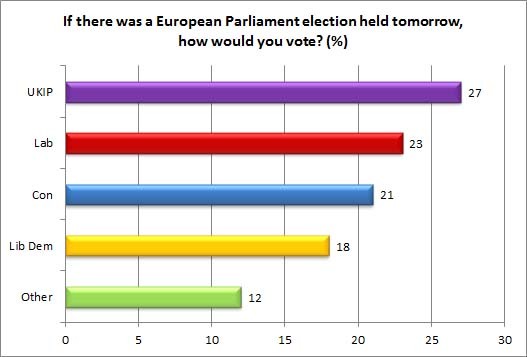 The results show that among those certain to vote in next year’s European elections, UKIP would come first overall with 27%, closely followed by Labour on 23%. The Conservatives would come third with 21%. Two-fifths (39%) of Conservative voters from 2010 would vote UKIP in a European election if it were held tomorrow – this remains a major problem for the Conservatives. However, paradoxically, there’s substantial support for David Cameron’s EU policy. If a referendum on Britain’s membership of the EU were held now, 37% say that they would vote to remain in the EU compared to 41% that say they would vote to leave. 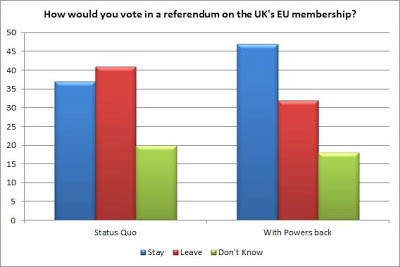 But, if there was a significant return of powers to Westminster followed by a referendum, 47% would vote to stay in the European Union, including one in five (20%) voters who say that they would vote UKIP in a UK General Election. Only one third of all voters (32%) would still vote to leave. Of the individual party leaders, the public still has the most faith in David Cameron to negotiate a better deal for the UK in EU – though it’s clear that there’s a high degree of scepticism about whether a new deal can be delivered by anyone. In order address this 'credibility deficit', Cameron must start to press ahead with substantial reforms now. In general, one thing is clear. That is the desire for a wider choice between simply In or Out. When asked to choose between different possible relationships that Britain could have with the EU, the public’s preferred option is to remain a member of the EU, without the Euro as their currency, but with the significant return of EU powers to the UK (38%). Surprisingly for an anti-EU party, “only” 61% of UKIP voters said they favoured completely withdrawing from the EU, with 30% saying they would be content with “significant return of EU powers”. For every other main party, a slimmed down EU was the single most popular option, suggesting that Ed Millband and Nick Clegg risk ending up out of step with their own voters if they continue to sit on their hands. - In a General Election, Labour would win 37% of votes, followed by the Conservatives on 26%, UKIP on 20% and the Liberal Democrats on 9%. Under current constituency boundaries, Labour would win a majority of 110 seats with the Conservatives losing 102 seats. UKIP would not win any seats. - More than half (55%) of the British public think that the Government should prioritise allowing the UK to have its own immigration policy when seeking to reform Britain’s relationship with the EU. Other areas of priority include giving the UK Parliament more powers to block un-wanted EU laws (42%), reducing Britain’s contribution to the EU budget (36%) and allowing the UK to have control over police and criminal justice laws (32%). - 38% support the Prime Minister’s policy of negotiating new EU membership terms for the UK and then having an in/out referendum versus 32% who oppose it because they think meaningful renegotiation is impossible or want to withdraw altogether. Only one in ten voters (11%) say they favour the status quo and fear Cameron’s strategy creates “uncertainty”. 68% of Conservative voters, a surprising half of Lib Dem voters (52%), 32% of Labour voters and 21% of UKIP voters support Cameron’s strategy. - However, when asked the question differently, six in ten (60%) think that it is unlikely that the Government will be able to deliver the changes it wants in the UK’s relationship with the EU – showing that whilst there’s support for Cameron’s strategy in principle, there remains a ‘credibility deficit’ which he must seek to close by pressing ahead with substantial reforms now. See here for our full briefing on the poll results. The Bundesbank, The Deutscher Aktieninstitute (DAI), and even EU civil servants from the 11 participating countries have all warned against the FTT in its current form. Today saw yet another German voice raised again the tax – this time from the very party that is meant to be its greatest champion. Nils Schmid, Baden-Württemberg's Minister of Finance – from the German social democrats (SPD)— wrote a letter to German Finance Minister Wolfgang Schäuble condemning the FTT in its current form as “rubbish.” Ouch. Schmid’s intervention, says that "If the financial transaction tax is implemented as is currently planned, initial estimates show that it is likely to have a serious impact on certain segments of the market (money and capital)." He then calls for a “proper configuration” of the FTT. So why is this important? Twofold: first, it shows that in light of the overwhelming evidence of the negative economic impact of the FTT in its current form, the support for the proposal is quickly evaporating. This now extends to the German political parties that have strongly endorsed it. 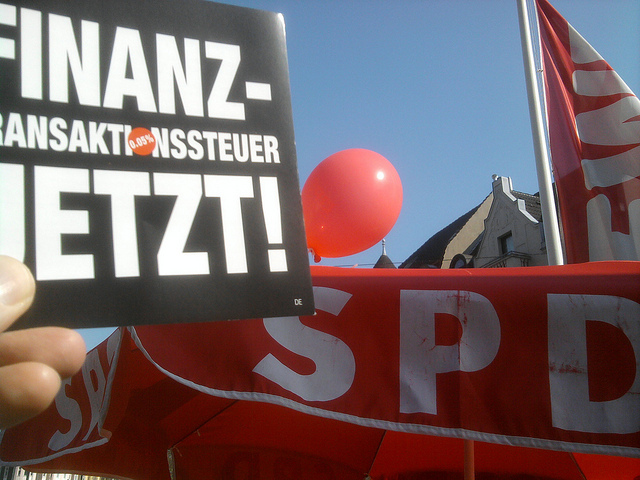 Remember, the FTT is one of the SPD’s main campaigning issues, and served as the party’s quid pro quo for accepting the EU fiscal treaty. Although Schmid caveated his position, saying that he is not opposed to the idea of a FTT in theory, the point has most definitely been made. 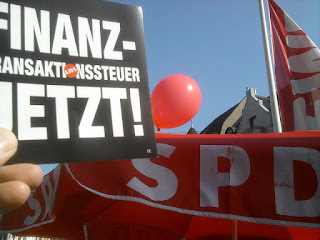 Secondly, the FTT controversy has legs to become battleground ahead of the German elections in September. It is an issue that may split politics, both, within the parties and on a national level. Meanwhile, deputy chairman of the FDP parliamentary group ,Volker Wissing, saw his opportunity to strike – and took it, saying that Schmid's letter shows with which "naivety" and "rose-tinted blindness", the SPD had driven the demand for a financial transaction tax. So far the SPD have remained stumm on Schmid’s intervention. But watch this space. If influential figures within SPD are the latest to start make noises about this, then surely, the Commission’s proposal cannot stand? Would an 'independent' UK get a better US trade deal than the EU? 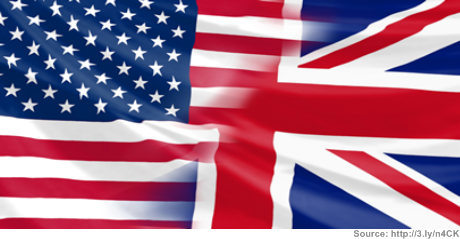 Could the UK sucessfully negotiate a trade deal with the US? Yesterday MEPs voted on a resolution to back defensive measures to exclude cultural and some agricultural products, such as genetically modified foods from a proposed free trade deal with the US (TTIP). Understandably US farmers have already taken exception to what they see as EU protectionism. This raises concerns that the potential gain from an EU/US trade deal may be watered down, delayed or even blocked all together by vested interests on both sides of the Atlantic. A mismatch in negotiating power. Although the UK exports a lot to the US, as a % of it's total exports, the US sends only 4% to the UK. So although a trade deal should be mutually beneficial, reaching a solution would be disproportionately in the UK's interests. Therefore, there would be an imbalance of negotiating power. For this the EU's weight could help on issues where the UK's interests are aligned with it. Fewer protectionist hold ups. At the same time, the US and the UK are more compatible economies than are the US and EU. 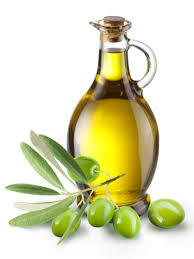 The UK negotiating on its own account would not be hindered by protectionist issues emanating largely from France and MEPs, that could hold up US agreement or require concessions, such as the protection of agriculture, genetically modified foods or geographical indicators. However the UK is still unlikely to wish to see the US allowed to subsidise its agricultural exports, so tough negotiations would still be required. Access for financial services could be a tough negotiation. 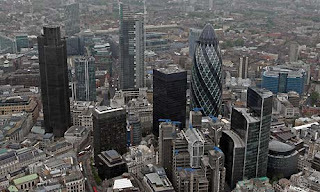 The UK negotiating with the US on financial services would come up against a powerful US lobby attempting to protect its banks from what is New York's main rival - London. However, the UK negotiating on its own would arguably have a better chance to strike a deal on 'reciprocity' with US funds, a more generous arrangement than that which currently exists under regulations such as the AIFM Directive or UCITS. Additionally the UK would not bear the burden of having risky eurozone banks getting in on the deal. In recent negotiations with Singapore the US gained a better deal than the EU on financial services, partly because while Singapore was happy with UK banks it was wary of giving access to all eurozone banks (a big untold story in all of this). There's an old Latin saying, "If you had kept quiet, you would have remained a philosopher." Reading the Commission's defence of its proposed EU financial transaction tax (FTT), that phrase immediately sprung to mind. It's not the strongest piece, to say the least. In our continuing quest for transparency, we have published the Commission’s direct response to the concerns raised by the 11 participating FTT member states (docs which we exclusively published last month). Arguably the most worrying part of this response is the tone. The Commission is essentially saying ‘we know better’ than financial markets. For example, in dealing with concerns over the impact of the FTT on short term trading, it suggests much short term trading is often “myopic” and that asset managers which trade predominantly in the short term should be subject to less investor demand in transparent markets, despite the success of money market funds and their importance for liquidity. Now, 'financial markets' are diverse, far from perfect and certainly not always right. However, the Commission would be remiss to just dismiss concerns raised by governments inside and outside the FTT zone - but also actors from across the business and manufacturing community (in addition to virtually every bank in Europe). We have long suggested that there are three key areas of concern which will have to be addressed before the FTT can even hope of being implemented without huge market distortions – the extraterritoriality, the impact on repo markets and the impact on government (and corporate) bond markets. As reported this morning, the Commission argues that a “business case” can be created for enforcing the FTT outside the FTT zone. Essentially, exchanges and clearing houses will be responsible for collecting the tax and if they don’t, the firms in the FTT zone will not want to trade with them. 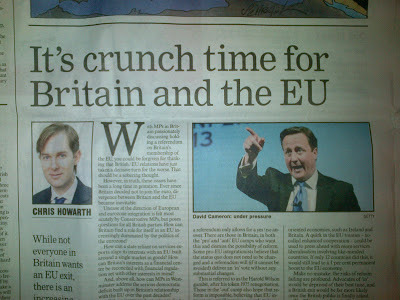 First, it will increase tensions and splits within the single market. Financial firms are unlikely to just roll over and accept this. In fact, given the size of the market outside the FTT zone, they could validly refuse to trade with those inside the FTT zone. In any case, the prospects of a scenario similar to that of escalating protectionism in trade dispute cannot be ruled out. It also seems very punitive, using alterations in the legislation (the joint and several liability) to enforce it in areas where the tax has already been rejected. This also assumes firms do not move out of the FTT zone to escape the tax. This seems unlikely in the first instance, while not being able to trade with those outside the FTT zone if they do not pay the tax (or having to pay their share yourself) seems to make staying inside even less appealing. The Commission also accepts that double taxation is a concern. However, the proposed solution of setting up agreements on where the tax will fall, seems unlikely especially in the UK’s case since it has launched a legal challenge against the tax. First, surely legislating on such a sensitive issue without fully knowing the costs on a key area, with many of countries involved in the midst of an economic crisis, is nothing short of negligent. Second, if member states are better placed to judge these issues, why does the Commission and the EU need to take the lead and push such a tax in the first place? Furthermore, we doubt the concerns over ‘redistribution’ will have been assuaged as the Commission accepts that some money from the trading of government bonds will not go to the country that issued them. This could be of concern for countries such as Spain, Italy or even France which have huge debt markets but whose debt is widely traded around the world and the EU but international firms. It also seems to punish small countries with less developed financial sectors, since the tax will be paid where the bond is traded firstly with the residence principle only kicking in afterwards. Possibly more worrying is the response to concerns over the corporate debt market. The Commission seems to brush this off, adding that it is “not aware of any credit crunch” with regards to borrowing for businesses. This is despite the clear survey results showing businesses struggle to access credit in many European countries and the many, many press stories on the issue. It surely cannot argue that given the state of the economy, now is the best time to implement the tax. As we have highlighted this is an area of serious concern. Unfortunately, the Commission continues to persist with a weak counter-argument insisting that repo markets can be easily replaced by secured loans or lending by central banks (while accepting the short term repo market will be all but destroyed by the tax). The market has access to these other instruments but see repo as preferable, the Commission still insists, however, that it knows better. Moving more lending to central banks is not desirable! European policy makers are working hard to restore usual financial markets and move lending off central bank balance sheets. Without normal functioning markets, monetary policy cannot have an effective impact, while in the eurozone money will not flow cross border and imbalances will continue to build up (any hope of an integrated banking union would be dead). Furthermore, all the risks will be taken onto the central banks’ taxpayer-backed balance sheet – surely this is a terrible form of risk being socialised but profit privatised. Secured loans do not provide the same level of legal protection as repos. Since collateral is purchased under a repo, if there is a default the collateral has already changed hands. However, under secured loans the claim would go back into normal (lengthy and costly) insolvency proceedings. The Commission does raise the point that Repos can hurt financial stability, but surely this is more a case for effective supervision and regulation than taxing the market out of existence. With widespread talk of the FTT being shelved for at least another year, perhaps it's time for the Commission to just admit defeat? Yesterday saw the opening salvo of what is sure to become a heated debate over the new ‘technical standards’ for the EU’s banker bonus rules. Why is this so important? Well, these rules will essentially determine how far reaching the EU's already controversial bankers' bonus cap will be. But this decision also encapsulates a range of other issues that will have a defining impact in the way Europe is governed in future - and whether there's a future for the UK in there somewhere. (iv) their variable remuneration exceeds €75,000 and 75% of the fixed component of remuneration. 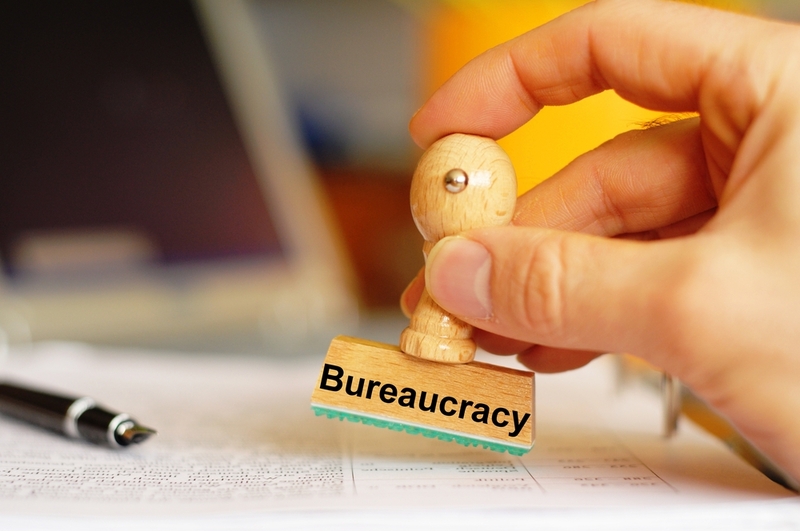 Are the EU agencies already exceeding their mandate? As we flagged up at the time of their creation, there's a substantial risk of mission creep under the EU's three supervisory agencies - EBA, ESMA, EIOPA - due to the fluid nature of these bodies. 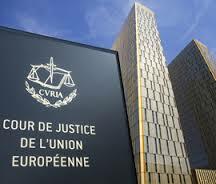 Remember, under the ECJ court case which allowed these agencies to be established under the EU single market (via QMV and co-decision), they should be blocked from having any type of decision-making powers. But EBA's standards on remuneration comes worryingly close to legislation. Politicisation of ‘technical standards’: Related to this, and as we also flagged up at the time, technical standards have a worrying tendency to become politicised - which clearly is the case here. This type of stuff should be decided through political negotiations and defined within the regulation. Any necessary technical background and info should be provided for and incorporated, even is this means delaying the legislation slightly. Need for non-eurozone safeguards ASAP: Though this isn't strictly a eurozone vs non-eurozone issue, it does illustrate just how vulnerable the UK and other outs could be to eurozone caucusing in banking / financial rule-making. This is also exactly why the UK and other non-eurozone countries need to ensure that the agreement in principle for double majority at the European Banking Authority - that Open Europe first floated - are held up and pushed through. Trade-off between "single rulebook" and control: The UK says it likes the EBA since it contributes to a single rulebook for the single market, and can, for example, contribute to stamping out protectionist implementation of banking rules in Europe. This is all true. However, it does, of course, assume that the UK itself is writing the single rulebook, which may or may not be the case. Democratic accountability: As the Times noted today, with central banks such as the Bank of England (BoE) and the ECB taking over financial supervision they must become more transparent and accountable. In this case it is unclear what role the BoE played in drafting the rules or whether they raised the concerns pushed by the government and firms in the UK. Again, this is only a first draft. The public consultation is open until August, after which the EBA will review the evidence and provide a new draft - so a lot of the issues we highlight below should be considered with this in mind. There will then be a vote in the EBA with the final standards needing to be submitted to the Commission (which will approve or reject them) in March. One final interesting point here is that any vote in the EBA could come close to coinciding with the introduction of any double majority rules, although there are a lot of hurdles to overcome before then. Expect a summer of furious lobbying and behind the scenes discussions as the UK and others make a final push to water down these proposals. 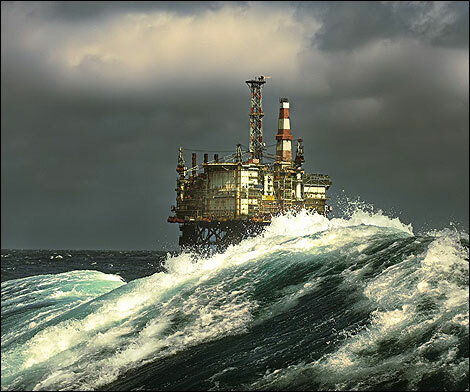 MEPs yesterday voted on a new safety regime for offshore oil and gas platforms. And what do you know, it appears that the UK has managed to come up with an acceptable solution. Fears that the Commission's original plan to push its plans via a regulation (which have direct effect) have not materialised and it is now to be done via a directive, giving states some leeway, and through careful negotiation the final outcome is similar to the existing UK rules. This is interesting on a number levels. Firstly it is a good example of the UK successfully pushing its case in the EU. It is also a good example of how the UK can use its weight to influence MEPs and the Council of Ministers - and for the benefit of an industry based primarily in Scotland. With MPs in the UK passionately discussing holding a referendum on the UK’s membership of the EU you could be forgiven for thinking that the UK/EU relations have just taken a decisive turn for the worse. That should be a sobering thought. However, in truth these issues have been a long time in gestation. 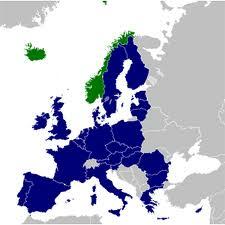 Ever since the UK decided not to join the euro divergence between the UK and the EU became inevitable. Unease at the direction of European and eurozone integration is felt most acutely by Conservative MPs but poses questions for all UK parties. How can the UK find a role for itself in an EU increasingly dominated by the politics of the eurozone? How can a state reliant on services exports align its interests with an EU built around a single market in goods? 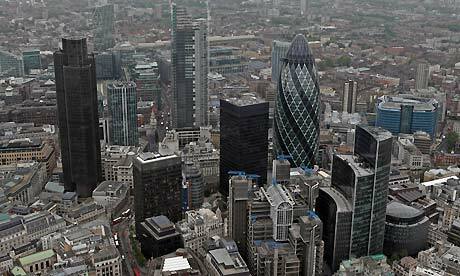 How can the UK’s interests as a financial centre be reconciled with financial regulation set with other interests in mind? And above all, how can MPs in Westminster address the serious democratic deficit built up in the UK’s relationship with the EU over the past decades? All these issues are beginning to find their way into the mainstream of UK political debate. In Ireland a series of EU referendums provided an avenue to openly discuss the EU. In the UK we have not had the same level of public debate. Instead of debate we saw the Lisbon Treaty, like those before it, rolled into law at the behest of Government whips. These European chickens are now coming back to roost. When the Lisbon Treaty came into force the then shadow foreign Secretary William Hague said cryptically that “we will not let matters rest there”. King Lear would perhaps have added “I will do such things. What they are, yet I know not: but they shall be the terrors of the earth” but the effect on EU Governments would have been the same. Demanding treaty change, except of course for the centralising type, was unthinkable. Now after three years in power we are a little clearer as to what terrors the Conservatives had in mind. David Cameron has said he wishes to attempt to reform the EU, renegotiate the UK’s membership terms and then hold a referendum on the UK’s membership after the next election but no later than 2017. Despite setting out this plan frustration among Conservative MPs has continued to build. In an attempt to defuse weeks of pressure Cameron has now agreed to back and vote for a Bill to put the 2017 referendum into law. Why legislate now? You might be forgiven for thinking Cameron’s MPs do not trust him. Some don’t. But, what concerns them most is that the electorate will not trust them to deliver a referendum after the 2015 election. That matters with UKIP gaining 26% of the vote in the recent local elections. The desire for a referendum is real but a referendum only allows for a yes/no answer. There are those in the UK, in both the ‘pro’ and ‘anti’ EU camps who want this and dismiss the possibility of reform. Some pro-EU integrationists believe that the status quo does not need to be changed and a referendum will (if it cannot be avoided) will deliver an ‘in’ vote without any substantial changes. This is referred to as the Harold Wilson gambit, after his token 1975 renegotiation. Those in the ‘out’ camp also hope that reform is impossible believing EU intransigence will convince people to leave. Like the Baptists and bootleggers in prohibition US, both sides have a common interest in reform failing. 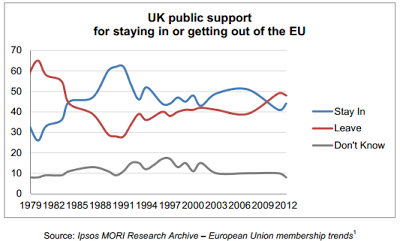 However, public opinion in the UK is not yet that polarised. The majority of business and public opinion does not wish to leave the European Union but is also not happy with the status quo. Instead they wish to see reform. The task David Cameron has set himself is achieving new terms that the majority of the UK public would be happy to endorse. This is a tough task, but Cameron believes that if pushed, states such as Germany who value the UK’s advocacy of free trade and liberal economics would back reasonable reforms. So the million euro question is what could a durable EU-UK settlement look like? First, the power of national parliaments over EU decisions needs to be radically strengthened, to reconnect the EU to voters. Secondly, as the Eurozone integrates further, the UK and other non-eurozone countries need safeguards to make sure euro countries don’t start to write the rules for all 27 member states, in which the case the UK almost certainly will have to leave. There’s also a very strong case for revisiting areas where the EU’s powers have gone too far, such as in crime and policing or employment law. However, in some areas “more Europe” may be needed. For example, a big move on liberalising services would help make the EU more relevant to an increasingly sceptical business community. The EU services sector is one of the bloc’s great untapped resources, but for too long, protectionist-minded member states and the European Parliament have blocked a dynamic single market in services, to the disadvantage of services-oriented economies like Ireland and the UK. A quirk in the EU Treaties – so-called enhanced cooperation – could be used to press ahead with more services liberalisation involving like-minded countries. If only 12 countries did this, it would still lead to a 1% permanent boost to the EU economy. Make no mistake, the risks of reform failing are profound. Advocates of ‘in’ would be deprived of their best tune and a UK exit would be far more likely once the British public is finally asked. States in favour of open markets and free trade would lose a strong ally. The EU could then chart a new course more centralised and protectionist than before. But rather than engage and negotiate with Cameron perhaps the best strategy is to sit tight and hope for a Labour victory in 2015? That may paradoxically be the worst option for those wishing to avoid a UK exit. Not only would the Labour party come under immense pressure to hold its own referendum, but would be destined to hold a referendum without having attempted or achieved any meaningful reform. Worse, a mid-term Labour Prime Minister campaigning for an ‘in’ could be faced with a new post-Cameron Conservative leader campaigning for an ‘out’. As for the Liberal Democrats, Nick Clegg recently told Parliament that treaty change is a matter of “when not if” and would trigger a UK referendum. The worst of all worlds, a treaty change dreamt up with no UK input being put to the British people – the answer to that would be a decisive ‘out’. So will the UK leave the EU? This is not a certainty but the real possibility should concentrate the minds of those who share some, if not all, of the UK’s interests. Rethinking the EU’s direction of travel, re-centring it on a single market that works for services as well as goods, economic competitiveness, less regulation, decentralisation and the legitimisation of the positions of non-euro states could be useful in reconnecting not just with the UK public but with others as well.